The new model 1542P-3SP Hypro Poly Transfer Pump from Pumps and Sprays is a high-powered, self-priming transfer pump powered by a 5.5 HP PowerPro engine. With flow rates of up to 560 lpm and pressures up to 58 psi, this transfer pump delivers solutions for your fluid and chemical transfer needs. The polypropylene pump body makes this product ideal for use in transferring a variety of fluids including corrosive chemicals like Roundup, Flexi-N® and Atrazine. Tank filling, floodwater removal, and lawn & garden watering applications are just a few more of its many uses. So when in need of a high-quality transfer pump, think of Hypro – the company that has been bringing quality products to the market for over 50 years. • Polypropylene housing is suitable for corrosive environments. 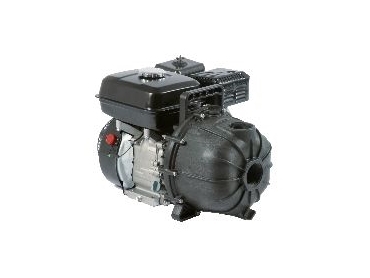 • 5.5 HP PowerPro engine with overhead valve. • Low-oil sensor prevents engine seizing when oil level is too low. • 3-vane impeller can handle solid particles in suspension up to 3/8" diameter. • Self-priming capabilities with maximum suction lift up to 7 m.
• Easily handles high-capacity liquid transfer jobs with flow rates up to 560 lpm. • EPDM mechanical seal and inlet valve for longevity and reliability in most applications. • Supported with one-year Hypro warranty on pump and engine. • Pump and engine repair parts available for easy servicing. For further information please contact Mark Batson or Greg Pedler at Pumps and Sprays on 02 96279898.